The fossil record of birds, from Luis' and other accounts, is rapidly improving but still sketchy. Most bird fossils are small and fragile, so the record likely treats them poorly. Thus the documentation of pre-Creta-ceous birds is extremely impoverished. Of course, there is a brilliant and famous exception to this rule. In 1861 a fossilized birdlike skeleton was found in an Upper Jurassic limestone quarry near Solnhofen, in southern Germany. The skeleton was named Archaeopteryx lithografica and it was joined at various times over the last century and a half by a handful of other precious skeletons representing this form. Remarkably enough, Archaeopteryx not only had exquisitely detailed skeletal and skull parts; the limestone was also finely etched with the impression of feathers. The earliest appearance of birds was, then, as a matter of record, indicated by one of the best-preserved and most beautiful sets of fossils in the world. Some specimens of Archaeopteryx show feather impressions, others don't. 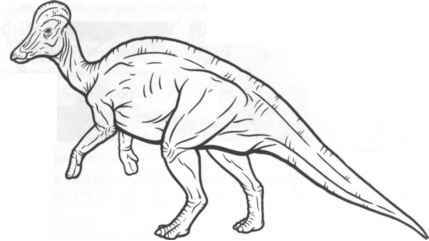 For some time the "featherless" skeletons from the Jurassic limestones were thought to be small theropods—coelurosaurian dinosaurs, like Compsognathus. But it was soon apparent that these were simply fossil skeletons deprived of feathers through less favorable preservation. Detailed work by John Ostrom at Yale in 1973 revealed a reason for the mix-up. Archaeopteryx, as the earliest bird, bore an uncanny resemblance to coelurosaurs. In 1973, Peter Wellenhofer, a German paleontologist whose talents extend to exquisite technical drawings of specimens, also noted strong similarities between coelurosaurs and Archaeopteryx, based on a featherless skeleton of the latter discovered in Eichstatt in 1951 and mislabeled Compsognathus. have a crescent-shaped wristbone (semilunate carpal). In non-avian mani-raptors this bone is distinctly separate, but it is in close contact with the other bones of the wrist. In birds, this bone becomes fused with the wrist, but its crescent shape is still apparent. Other features of special similarity are found in the construction of the pelvis, the development of the large airspaces in the skull, the comparatively large brain cavity, and details of the feet and vertebrae. Birds even show a connection with theropods at a broader level; just like Tyrannosaurus, they are characterized by an S-shaped curve of the neck, a hind foot with three ground-hugging toes, and a small fourth toe held high off the ground on the back of the foot. Birds not necessarily of a feather do flock together. The convictions of Ostrom and Wellenhofer, as well as of Jacques Gauthier and other scientists, on the tight bird-dinosaur connection are not really new. In the 1860s and early 1870s the famous biologist Thomas Henry Huxley passionately argued for bird-dinosaur affinity. The anatomist Gerhard Heilmann took on the whole problem in a book published as early as 1926. He noted, after an astute survey of vertebrate groups, that coelurosaurs seemed to be the best candidates for the relatives of birds. Unfortunately, the latter lacked a key bird feature—a wishbone formed by the fusion of the two collarbones (clavicles). Heilmann thus concluded that the bird-coelurosaur resemblance was simply a matter of convergence, namely that the true ancestors of birds should be found among more primitive but as yet unidentified archosaurs from the Triassic. He also suggested that birds evolved from archosaurs living in trees. Al legedly, these forms first modified forelimbs into parachutes for sailing, further refined the wing for gliding, and eventually attained the flapping, powered flight seen in birds today. Despite Heilmann's misgivings, the idea that birds and theropod dinosaurs are indeed closely related seems to stand up against most attacks. For example, some maniraptoran theropods, like Oviraptor, have a bird hallmark, a wishbone. The bird-dinosaur junction has been broadly accepted, but it has a few detractors. Some embryologists argue that the finger bones elongated in true birds (digits 2, 3, and 4) are not the same as those elongated in theropods (thought to be digits 1, 2, and 3). The argument raises a paradox because Archaeopteryx, the supposed first bird, has the 1, 2, 3 formula, not the 2, 3, 4 formula of later birds. Some workers, like Alan Fedducia of the University of North Carolina at Chapel Hill and Larry Martin at the University of Kansas, strenuously reject the bird-dinosaur hypothesis. They claim, much in the vein of Heilmann, that a transition from coelurosaurs to birds is highly unlikely because none of the former were tree-dwellers capable of evolving to the next gliding stage necessary for the bird heritage. They also stress that many of the relevant coelurosaurs with birdlike features are of Late Cretaceous age, occurring much too late to be near the roots of bird ancestry. Two counterpoints can be raised here. First, the Heilmann scenario for transition from a non-flying to a flying animal that occurred some 200 million years ago is not a very tangible thing. In any case it should not be the basis for rejecting a pattern that is clear from the "hard" anatomical evidence. The uncertainties that come with constructing such scenarios about the appearance of adaptations in birds and other organisms will be expanded upon momentarily. Secondly, the elimination of Late Cretaceous theropods as relevant to the question of bird origins because of their later appearance in the fossil record than Archaeopteryx reflects a basic and frequent misuse of fossil evidence. The first fossil found in the record for a particular group is not necessarily the indication of the time of origin of that group. We could someday find fossil birds much older than Archaeopteryx (indeed this has been claimed, but the alleged candidate, Protoavis ["pre-bird"] from the Late Triassic, is highly questionable). Why then should we ignore some very birdlike theropods of the Late Creta ceous because they are younger than Archaeopteryx} In addition, would the discovery of an older fossil bird eliminate Archaeopteryx from consideration? Absolutely not. Archaeopteryx would still be important because it shows a wonderful mosaic of characters found in modern birds and—lo and behold—dinosaurs. There are even some animals alive today that show such mosaics. The duck-billed platypus and the spiny echidna of Australia and New Guinea retain primitive features found in other vertebrate groups that have been lost and modified in all other mammals. For one thing, these strange creatures don't bear their young live. They lay eggs, a reproductive habit that seems to be primitive for vertebrates. By this evidence, we are sure that the duck-billed platypus should be as old as the Mesozoic hills. Until a few years ago we just didn't have a specimen to prove it. A jaw of a platypus is now known from the Cretaceous of eastern Australia. We call such organisms "living fossils," because they retain ancient characters lost or drastically modified in their relatives. Archaeopteryx is a "dead" fossil, but whether it is Late Jurassic or Late Cenozoic in age, it would still bear the undeniable stamp of a species that importantly retains the characters of the bird legacy. In the same way, Oviraptor, Troodon, and kin are not organisms to be ignored when it comes to thinking about the origins of birds. The balance of anatomical evidence linking these forms with birds through Ar-chaeopteryx is undeniable. This leads inevitably to the question of family trees. Which of the various non-avian lineages of dinosaurs are the closest kin of modern birds? Since we have nested the latter within the Maniraptora, our exploration must focus on the lineages within this group. This important search is just under way, and it is a major preoccupation of Gobi team members Mark Norell, Jim Clark, and Luis Chiappe. At this point, the closest kin to Avialae is a tossup between oviraptorids and the clade including dro-maeosaurs and troodontids. But the investigation must extend beyond the usual list of suspects. It must include, for example, some incertae sedis members of the Maniraptora, like Avimimus. The phrase incertae sedis means "uncertain position" (the second word derives from the Latin verb sedeo, to sit). In other words, these taxa cannot be placed in a particular branch of the Theropoda with any confidence. Avimimus incertae sedis, on the other hand, offers a tantalizing glimpse of what is clearly a specialized theropod, with many odd, birdlike features. This form, based on fragmentary material described by the Russian paleontologist Kurzanov, is a small delicate creature. What is known of the braincase is very birdlike, but the anterior snout (premaxilla) reminds one of the construction in hadrosaurs. The hind limb has the ultra-theropod design with tridactyl foot, lacking even a small first (in other forms the most internal) toe. The pelvis is unusual in having a flange of the upper (iliac) crests medially directed in a most birdlike fashion. The most puzzling aspect of the skeleton is the forelimb. Although the upper arm (the humerus) resembles that in theropods, a bone of the lower arm, the ulna, has a long roughened ridge that Kurzanov interpreted as an attachment for feathers. Moreover, some fragments of the bones in the hand (carpometacarpals) have very much the appearance of the hand of birds. Unfortunately, the incomplete material of Avimimus prevents much more thought about the affinities of this creature. There is even some suspicion, expressed by our colleague Perle, that the reported skull may be that of a very young oviraptorid and not associated with the Avimimus skeleton at all. The investigations of the mystery of bird origins must also embrace another theropod group, the ornithomimids. Notable among these is Harpymimus, first described by the Mongolian scientists Barsbold and Perle in 1984. Harpymimus was discovered in Hurrendoch, that Lower Cretaceous locality in the eastern Gobi that we found so bone dry in 1991. It has a highly flexible (prehensile) hand. This animal, known from a partial skull and associated pieces of the skeleton, is unique in having six or more tiny teeth in the very front of the lower jaw. It is odd for being, along with the newly described Pelecanimimus from Spain, the only toothed fossil among the otherwise toothless ornithomimids. Other members of this clan show conformity in the skull—long slender toothless jaws, large eye sockets with a ring of individual bones (sclerotic ring) that supported the eye—all features very reminiscent of birds. Untangling this Gordian knot of theropod strands—the key to solving the mystery of bird origins—is a tough problem. It must be tackled through studies of every bit of anatomical minutiae, from the architecture of the limb to the intricacies of the braincase. Yet the investigation is much better served than it was only a few years ago. We now have in hand some truly spectacular skeletons of primitive birds and non-avian theropods. Are birds and flying dinasuors the same?